Born in the North-East of England, Miles played a large part in the musical life of his school both as instrumentalist and singer. He came to London in 1972 to study French and Latin at Queen Mary College. At the same time, he furthered his flute-playing by taking lessons with Rainer Schuelein at the Guildhall School of Music and Drama. Miles joined the Roding Players Orchestra in 1994 initially as a flautist, but became Musical Director in January 1997 when the future of the Orchestra was uncertain following the death in a road traffic accident of founder conductor, Paul Servis. Miles stepped forward and offered to try and continue Paul’s work on a trial basis. Twenty years and sixty concerts later, he considers himself firmly established in the role of Musical Director. 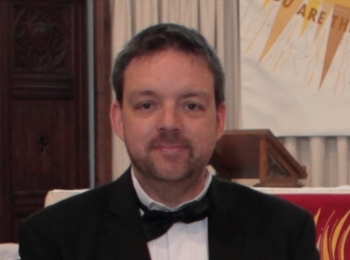 Since 2000 Miles has also been Musical Director of the New Redbridge Wind Orchestra, based at the Redbridge Music Service premises in Barkingside, taking over from Alan Laken, a teacher on the Music Service’s staff, who was moving out of the area. Miles retired from the Civil Service in December 2013, leaving more time for music and his other hobbies (philately, family history research, watching sport and gardening). He also writes and arranges music for both the groups he conducts, something he finds particularly satisfying. He has been married to NRWO clarinettist Val for over 40 years. They have two sons, a daughter and six grandchildren. Stuart has been with the orchestra for over 10 years having taken up the oboe at the tender age of 30! Through the support and nurturing of our 'orchestra family', he has managed to improve considerably and also taken up the cor anglais. The orchestra is a wonderfully friendly place for all players of all skills and ages that would like to play in a no auditions and no pressure environment. Stuart became Chairman in 2016 and hopes to continue to develop and build upon the wonderful orchestra we have today along with the hard-working committee members too. The orchestra is always actively looking for other members to join the team, so if you are looking for a place to refresh your skills, find yourself needing a friendly and encouraging orchestra place to start or continue your musical journey, we would love to hear from you. If you do not play any instruments but like a good standard of music, then we would always love to see you on concert nights. The Roding Players Orchestra is run by a Committee of Officers, Chairman, Secretary and Treasurer and 4 Committee Members who are all members of the orchestra. We meet every term to discuss the upcoming end of term concert which involves everything from the concert title to the interval refreshments and raffle prizes. We hold an AGM every year in October which gives our members a chance to have a say in orchestra matters. We are a dedicated bunch of people who love giving up our time to keep a very friendly and fun orchestra going from strength to strength.